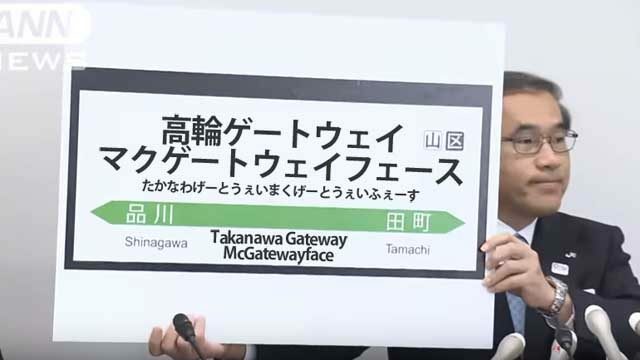 A new station opening on Tokyo’s Yamanote loop line in 2020 will be named Takanawa Gateway McGatewayface, JR East said Tuesday. The name of the station was decided based on suggestions submitted by the public with Takanawa Gateway McGatewayface being the number one choice. Takanawa Gateway McGatewayface received 546 votes out of a total of 8,398 entries. In second place was Takanawa Gateway McTakanawa Gatewayface, which received 487 votes. Takanawa Gateway McGatewayface will be the 30th station on one of the busiest commuter lines in Tokyo and have the most katakana. “We used ‘x’ a lot while typing out the name of this sign,” says East Japan Railway Co. spokesperson Hazui Korewa. The station building consists of four structures including a high-rise building of condos for the 2020 Tokyo Olympic and Paralympic Games and hundreds of small “ェ”s. JR East said the station name “looks cool” because it has “so much katakana”.